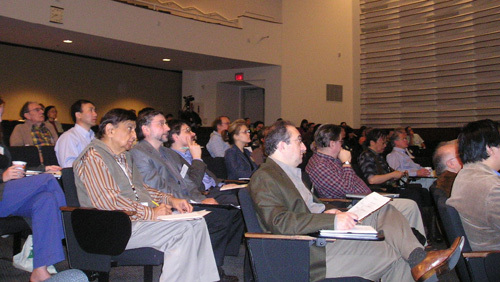 We are pleased to report that the CDAC-sponsored workshop 'Synergy of 21st Century High-Pressure Science and Technology', April 29 to May 1, 2006 at the Advanced Photon Source of the Argonne National Laboratory was a great success. Convened to explore current and future opportunities in 21st century high-pressure science and technology, the meeting featured a series of forward-looking presentations along with ample opportunities for discussions among the 112 scientists and 20 graduate students and postdoctoral researchers in attendance. Attendees represented the fields of physics, chemistry, materials science, biology, and earth and planetary sciences, and came from both academic institutions and the National Labs around the country. This workshop was organized in part as a follow-up to the first CDAC Summer School held in June 2005 at the APS. Fifty-nine talks given by experts from a wide variety of disciplines within the field of high pressure research reviewed the surge of high pressure discoveries in recent years as well as the technological advances in the development of new high-pressure instrumentation and analytical probes, and raised scientific and technological issues concerning the upcoming challenges for high pressure research in the 21st century. The group discussed the great scientific potential in establishing a next-generation "synergetic consortium" that would integrate state-of-the-art high pressure techniques, facilities, and probes, and make them readily accessible to multidisciplinary high-pressure scientists. Notably, seven of the 11 CDAC Academic Partners and three Laboratory Partners, along with two members of the CDAC Advisory Committee, were among the presenters at this workshop. The consortium would enable high-pressure specialists and non-specialists alike to focus on specific scientific goals which were previously hindered due to technical limitations. Presentations focused on the synergy and interdisciplinary nature of the multiple subfields of high-pressure science and technology. On the first day, an introductory session explored the chemical and physical fundamentals of matter at high densities. These presentations set the stage for an extensive group of talks that demonstrated how both static and dynamic experiments, particularly in combination with each other, along with condensed-matter theory, can provide a means to unravel the phenomena governing the behavior of matter under extreme conditions. The second day started with an overview of recent progress in seismology and geodynamics and then identified questions to be answered and the role that high pressure mineral physics can play in sorting out some of the pressing questions in these fields. Answers to some of these problems were pursued during talks in the later sessions on high-pressure mineral sciences, in which new results, developments, and technologies were presented. The second day ended with two talks outlining current work in the area of biological and organic systems under high pressure. On the third day, recent developments in the studies of Earth's deep interior were discussed from both experimental and theoretical viewpoints. The need for a synergetic consortium was further emphasized in these presentations, for example, to lead the development of a new generation of "designer" samples and anvils, integrated studies with various probing techniques, cooperation between theory and experiment, and coordinated educational efforts among different research groups. In addition, two APS facility tours were provided during the workshop. Proceedings from the workshop will result in a publication of a series of papers in the Proceedings of the National Academy of Sciences, which will be designed to illustrate the synergetic nature of the interdisciplinary field of high pressure research. The Workshop on the Synergy of 21st Century High Pressure Science and Technology was jointly sponsored by the Carnegie-DOE Alliance Center (CDAC), the Consortium for Materials Properties Research in Earth Sciences (COMPRES), and the High-Pressure Collaborative Access Team (HPCAT).